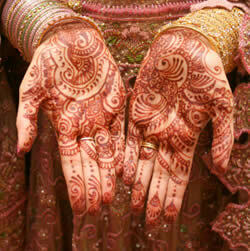 Henna is a widely known decorative material used to beautify hands and feet. It is also known by the names of Mehndi and Mylanchi. Fetched from a bush known as Lawsonia Inermis, Henna leaves are dehydrated and crushed to form henna powder. Then water is added to form a thick Henna paste. In ancient era the Henna paste was used to provide comfort in the diseases related to the blood circulation and various other pains. Today, Henna has got an entirely different usage and significance. Nowadays, Henna is used for beautifying hands, legs and dyeing of hairs all across the world and especially in Indian Subcontinent. Plastic or paper cones are used for beautifying hands and feet, and small brushes are put to use when it comes to dying hairs. In some Asian countries like India and Pakistan the bridegrooms are also beautified by Mehendi. In Morocco the Henna ritual is performed during the 7th month of pregnancy. In Kuwait, UAE and some other countries the Mehendi rasm (Henna ritual) is celebrated few days before the wedding ceremony. Other than marriages, Henna is used widely by the Muslim community in Kerala (India) on various occasions of religious significance. Combined with the religious symbols, the designs of fish and butterfly are very popular in North Africa. Pakistani designs are born after the amalgamation of North Indian and Arabic designs, but with one exception, Muslims do not use the designs of any human body part, birds or animals as it is against their religious preaching. Representing the most modern approach, in UK basic patterns like of bracelets, rings etc are utmost preferred. Though henna is used in various ways and on numerous occasions but the most unique and common usage no doubt is with context to Indian weddings. In India the "Ritual of Mehndi" is celebrated by the bride's family. The ritual is held one night before the wedding. It is looked at in the form of party or family gathering to enjoy the moments, wherein Henna is applied to the bride's hands and feet. Contrary to the earlier times, now even many of the female family members and friends of the bride are keen for applying Henna on their hands and feet. Engraving initials of groom's first name on bride's hands is also becoming very common. Once the Henna designs and patterns are created, the skin is kept untouched for about a night time and the bride does not do any household work until the Mehndi completely dries up. After all the designing of Henna is done, the Mehndi night is enjoyed with traditional music, dance and dinner. Later the skin is washed with lukewarm water. The fragrance and color of the Henna remains on the skin for some days or for some weeks depending on the quality of the Henna paste used. The final color comes out to be reddish brown and the patterns on the skin looks absolutely gorgeous. Lastly, the basis forming part of this tradition is the belief that the bride will get even more love and affection from her in-laws according to the longevity of duration that the color lasts. Longer the duration more will be love getting showered upon the bride. Though just a belief, but all the necessary care is taken by the bride's family to ensure that the henna paste is of optimum quality, which will further ensure that the henna color does not get off that easily. Many other ingredients like Amla, Shikakai etc are incorporated in order to achieve the desired results.